Take flank steak and put in a 9x13 pan. Season with salt and pepper and add olive oil. 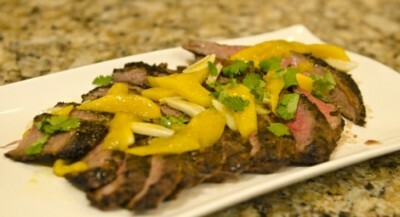 Arrange mango slices over the steak. Take the limes and squeeze the juice and also add the cut quarters. Cover and let sit on the counter for 2 hours. Heat grill or in-door pan on a medium-high temperature. Grill steak for 4 minutes on each side. You will see grill marks on the grill but the temperature should be medium rare. Let sit on the counter for 10 minutes. Place the sweet potatoes in a large bowl and toss with olive oil until the sweet potatoes are coated. Add the paprika, chili powder, sage, salt, and pepper; toss to distribute evenly. Arrange the coated fries in a single layer on the prepared pan. Bake for 20 minutes on the lower rack until the sweet potatoes soften. Transfer the pan to the upper rack of the oven and bake 10 minutes longer, until fries are crispy. Place all ingredients in food processor and blend on high until smooth.